A crowd at the High Altitude Sports Center applauds the winners of the men’s division A 50-meter sprints in January 2000. The men were from Canada, Japan, and the Netherlands competing in the World Cup Speed Skating meet. A Zamboni overlooks the speed skating track at the U.S. High Altitude Skating Center in Butte recently. Former Olympic speedskating star Bonnie Blair cheers for her daughter Blair Cruikshank in the women's 500 meters during the U.S. Olympic long track speedskating trials Jan. 5 in Milwaukee. Butte native Dave Silk was an alternate member of the U.S. speedskating team at the 1984 Winter Olympics in Sarajevo, Yugoslavia, and competed at the 1988 Winter Olympics in Calgary, where he placed sixth in the 5,000 meter event, 14th in the 10,000 meter event, and 15th in the 1,500 meter event. Silk was a World Cup winner in 1986 and is a member of the U.S. Speedskating Hall of Fame. He is now an emergency room doctor at St. James Healthcare in Butte. A clipping from The Montana Standard following the 1987 World Cup in Butte shows U.S. speed skater Frank Filardi immediately after breaking his ankle in the men's 500-meter race. I figure putting together this piece was my welcome to Butte. Shortly after moving here I was asked to do a story about the speed skating oval outside of town. With the Winter Olympics looming, it would be a way of tying a local angle to the center stage of sport. After a couple of days combing through the Butte public archives though, I found just how much hope, money, politicking and disappointment went into the rise and fall of the U.S. High Altitude Sports Center. BUTTE — A few days a week, you can drive out on Continental Drive, take a turn onto Olympic Way, and watch ice skaters take turns on a giant frozen oval. A timing tower with the Coors beer logo inscribed on it sits at what was once a starting line. Skaters today will take a turn down the back stretch and finally come up the home stretch, passing a Zamboni tucked neatly behind a storage unit. On their way to completing a full lap, they'll be cast in the shadow of a big, hollow building. Thirty years ago, that Zamboni perfected the track before world-class speedskaters took to the ice for training sessions. That big building served as a locker room for athletes from as far away as the Netherlands and Germany. The timing tower recorded times of skaters competing just months before vying for gold at the 1988 Calgary Olympics. The U.S. High Altitude Sports Center still exists as the Butte High Altitude Skating Center, but its days as the focus of international speedskating are long gone. By November 1987, nearly three years of fundraising and anticipation had the track completed enough to host the speedskating World Cup, a primer for the Calgary Olympics just a few months later. The American team shared the starting line with athletes from Canada, the Netherlands, Sweden, Germany, and a host of other nations. Bonnie Blair was a winner at 500 meters on the women's side, Dan Jansen a winner at 500 meters on the men's side, and hometown skater Dave Silk fourth at 1,500 meters. Butte being the home of speedskating for two days was supposed to shoot the Mining City to the forefront of the sport for years to come. Media outlets from around the world came to Butte to cover the races; families played host to international athletes; and the event was such a success, organizers said afterward Butte might have earned a second World Cup the following year. Some 3,000 people filled the grandstands each day of the World Cup. In a sport not recognized for being spectator friendly, on the weekend of Nov. 28, 1987, speedskaters had Butte's full attention. "It was so funny with the foreign skaters. They would go to the mall, people would see they were foreign by their jacket with Germany or Netherlands on it," Blair, now Bonnie Cruikshank, said. "Then at the rink, people were asking athletes to their house for dinner. "It's kind of how Butte people are. With open arms, they welcome you." At the start of 1985, a project spearheaded by Butte businessman Martin White began gaining traction. 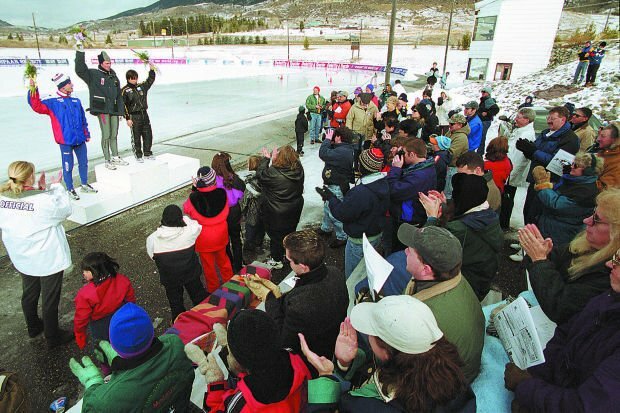 The idea at first was to install an outdoor ice skating oval in Butte, Silk remembers, noting the original intention of the center wasn't to host international competition. Instead, it was to serve as a training group for Olympians. It was to become a 400-meter ice oval, a hockey and figure skating rink, a cycling track, a roller skating oval, and home to a sports medicine division and an athletic testing facility. It was going to be, as a fundraising brochure declared, "Unique to the western world." "Outside the Soviet Union," the brochure claimed, "only the High Altitude Sports Center will offer complete, high altitude training programs for speedskaters and other Winter Olympic athletes." Initial funding for the center came from Butte-Silver Bow, private businesses, and individual donations. The Butte-Silver Bow Chamber of Commerce had pledged to raise $500,000 statewide for the center in November 1985. The goal for funding was a total of $6.5 million at first. The construction of the center was tagged at $3.5 million with another $3 million for operating expenses. In November 1985, a planned banquet at the Copper King Inn was a beacon to how committed Butte was to bringing the center to fruition. The banquet, in part hosted by center ally and 1980 Olympic gold medalist Eric Heiden, brought community members out in droves. In fact, the originally allotted 1,000 tickets for the banquet weren't enough. Community interest was at a fever pitch. The tickets sold quickly, and organizers were forced to open an "overflow room" to accommodate what would be a final estimated attendance of 1,400. If the brochure declaring Butte's ability to achieve the goal didn't prove this was more than a pipe dream, the banquet did. Heiden said at the event that "This will be world class. ... Once it's built it, will give Americans at least even footing with the rest of the world." Michael Crowe, then-U.S. speedskating coach, agreed. "We will make sure it's the finest facility in the world," he said at the banquet. "And we will need it, because in the next three to eight to 12 years, the United States will produce the finest skaters in the world." Crowe is currently on leave from his position as head coach of the Canadian speedskating team. "Nowhere but Butte would you get 1,400 people to a fundraising banquet when there's a college basketball tournament in town during hunting season." An advertisement titled "THANK YOU BUTTE" was taken out in the Nov. 25 Montana Standard by the sports center project. It listed donors at the time, noting more than $5,000 in cash had been given by Butte residents, and the banquet secured, after expenses, another $3,000 for the center. The funding bankroll sat at $319,285 following the banquet. A Montana Standard article said there was another $867,715 in pledged fundraising "virtually waiting in the wings for the $6.5 million goal." But the community seemed hooked; Securing the funds for the center almost a given. The looming task of actually completing the center went hand in hand with Butte's history of having an almost larger-than-life ethos. "Given its druthers, Butte would rather think big. Throughout its tumultuous history, Butte has been a city of superlatives: The richest hill, the toughest unions, the biggest pit, the wealthiest tycoons; city of champions, and of political winners; a pit of vice, a fountain of virtue. The most religious, the most irreligious." Butte's history with winter sports dates back to the 1800s. A retrospective article in The Montana Standard in 2007 noted "as early as the late 1800s, people began flooding lots for children to play games such as Crack the Whip while sports like hockey and curling gained popularity." A February 1930 edition of the paper dubbed Butte the "Center of Winter Sports in State." "Skating is enjoyed on a scale not approached anywhere else in the far west," the article said. A 1936 headline read "Largest of 22 rinks will be at Clark Park where new hockey field has been built for players." Judy Martz, who would go on the become executive director of the High Altitude center in 1986 and later governor of Montana, began her career as a speedskater in Butte and remained a part of the skating community for much of her life. She represented the United States during the 1964 Olympics in Austria, and coached — along with White — Butte youth skaters competing at national events in the years following. An article promoting the center in 1985 noted, "Since 1980, four national champions, five national records and nine national team members hailed from Butte." Along with the history of the sport, the environment for outdoor speedskating in Butte was near perfect. The city was chosen for the center because "it had the elements needed for winning team: clean air; low humidity; lack of wind; clear water; low temperatures; and an altitude of nearly 6,000 feet." "People loved it, in its run," Silk said of the center. "They still talk about Butte; they talk about how good the conditions were — ideal conditions, for the most part." Despite funding still to be secured, the center officially became the United States High Altitude Sports Center in April 1986. The center would be turned into a year-round facility with the new plan. The skating and bicycle tracks would be separated from the speedskating oval. There would be an Olympic-sized indoor figure skating or hockey rink. With the bigger dream came a bigger price tag — and no clear indication on the status of full funding. The construction of the center jumped from $3.5 million to $6.5 million to accommodate the expanded facility. A trust fund and future maintenance cost put the total price at $10 million. "It appears we're going to be able to raise the money at this point," White said at the time. He cited potentially receiving $3.5 million from the McDonald's Corp. That money never came. On Aug. 1, 1986, dignitaries from around the world converged on Butte for the U.S. High Altitude Sports Center's groundbreaking ceremony. Fundraising still wasn't complete, but the organizers remained confident in their ability to secure the funds. The show went on. About $1.3 million had been secured for the center, White said at the time. Still short of the $10 million price tag for total completion, organizers believed groundbreaking could help push the project closer to its goal. "We're really excited," White said. "But we have to make more progress, raise more money. We hope this (groundbreaking) will help us in our efforts." Balloons flew, local musicians played the Star-Spangled Banner, and leaders from around the world heaped praise on the center — and on Butte. United Nations ambassador Ignac Golob of Yugoslavia predicted the center would "soar up like the balloons." Golob, along with ambassador Richard Woolcott of Australia, said the U.N. was there to "promote peaceful competition, such as sports, as a means to draw the people of the world together." Crowe, coach of the skaters training in Butte, was then called to the stage. He said Silk, who was coming off a World Cup speedskating victory, was among America's — and Butte's — best chances at an Olympic gold at the Calgary Olympics. Another chance at gold was Cruikshank, who had moved to Butte for the opportunity to train with Crowe at the new world-class sports center. Cruikshank remains one of the most decorated Olympians in United States history. A gold medalist at the 1988 Olympics, she retired with five Olympic gold medals after the 1994 Olympics. In 1987, Butte became her home. As the sports center inched closer to its completion, she trained on the ice and took a full year of classes at Montana Tech. "It was a great place to live, a good and fun time," Cruikshank said. "I remember being surrounded by friends and teammates. That puts a smile on my face." The plans originally called for a permanent, refrigerated track. But with a World Cup having been awarded to Butte for that fall, a temporary track was put down while funding for the complete project was hoped to be just over the horizon. "They just couldn't do it," Silk said of a permanent track. "They didn't have the funding. (The thought was,) 'Let's do a temporary track, do the footing, get this thing on the map, and hopefully gain the full track.' Hopefully someday." The temporary track went down; a Zamboni was bought. Silk and Cruikshank recall training sessions giving way to carpentry work. If the community was all in on the track, so were the athletes. "I think a lot of skaters took a great pride in facility," she said. "Things needed to be done, athletes would roll up their sleeves and do what was needed. There was hope that there was going to be more funding that would finish everything, to have it be a state-of-the-art facilities." "It was a cool thing for Butte, with the skaters living and training here," Silk said. "For quite a few years, a lot of people economically benefited quite a bit. Having the skaters here impacted Butte's economy. It was a neat thing." Beyond the funding, an unfortunate turn in speedskating happened right around the time the starting gun was fired at that 1987 World Cup. As Butte celebrated its altitude and near-perfect outdoor elements, the sport was moving indoors. Silk says the first indoor speedskating oval went up in Holland some time in 1987. Beyond a few fringe meets, the sport never really moved outside again. The oval in Butte remained, never fully completed, as a training center and sparingly a competition site until the early 2000s. The final World Cup in Butte was held in 2000, though it didn't reach the level of excitement the inaugural cup did. As indoor facilities became the "gold standard" for speedskating, Dave Silk remembers, the sports center was slowly pushed out of contention for bids to host international events. "We couldn't get big meets anymore," Silk said. "It had a good run, but if it was permanent, we could be bidding for meets. However, the cost of running the track, compressors, chiller, cooler tower — it's hard to fund that." As the sport moved away from the elements, so did the athletes away from Butte. Cruikshank moved back to Milwaukee to train while a host of teammates went their separate ways. With funding losing hope and the sport changing, the fundraising brochure's promise of "America's Golden Opportunity" seemed to fall just short. "Had there not been as many indoor facilities," Cruikshank said, "it would have been a different ball game." Silk retired in 1990, having competed in multiple World Cups and the 1984 and '88 Olympic Games. He now practices medicine at St. James Healthcare and continues to put in work on the oval, just like he and a host of teammates did in 1987. He can be found at the oval still, trying to encourage area kids to lace up skates and hit the track. The infrastructure from the days of the World Cup and Olympic training still remain, and Silk hopes fundraising efforts and donations can help restore some of the magic that existed on Olympic Way. "There's a lot of things that were left from past years, including the building, equipment. We're still using the same Zamboni and plow truck. "The goal is to create an atmosphere that is family oriented," he said. "That involves making it aesthetically pleasing, working on the sound system, having a good quality ice... We hope to get more people on speedskates." Funding is needed just to keep the facility alive, yes, but Silk isn't willing to put a cap on the potential for what was once dubbed the world's center for speedskating. He says the sport is starting to make a move back outdoors, at least in part. What better outdoor venue is there than one that sits at 6,000 feet with long winters and not much wind? "If it takes off and becomes something bigger, that's great," he said. "But for the time being, the focus is local. It's got to be. To have meetings and talk about getting a world cup again — it's fruitless." Email Chance Cook at chance.cook@406mtsports.com. Follow him on Twitter, @ChQCook. The staff at 406 MT Sports is looking back and sharing our favorite stories from 2018. Each day leading up to 2019, we will share a different story and why it’s our favorite from the past year.